The Living Room, Halal certified five-start restaurant in Kuala Lumour invites all to renew ties this Ramadan, hotel restaurants get busy with preparing an elaborate spread for the breaking of fast. Featuring delicious varieties of traditional dishes and new interpretations, The Westin Kuala Lumpur's Ramadan spread promises to tempt all tastebuds. 25 Days, 130 Chefs, 210 Spices, 800 Dishes, 1200 Ingredients and a million smiles and warm memories at The Westin Kuala Lumpur! Led by Malay Chef Hamdan, the culinary experts at The Living Room will cook up a spectacular mix of local favourites coupled with Western specialities. Diners are in for a rare treats as they walk through the buffet counters. Break your fast with Zam Zam water and sweet dates. The appetizer counter, with more than 20 types of salads and kerabu, promises a good star. From nasi Ulam Seratus (100 herbs & fragrant leaves in white rice), Keli Leleh sungai Pahang(smoked cat fish with spiced coconut sauce), Ayam panggang Pedas Pucuk Paku (spicy roasted chicken ground coconut tendrils), Rojak, not forgetting a myriad of pickled fruits, flavored crackers, salted eggs and fish, fried anchovies and other 'must have' condiments. Ground peanut, sesame seed and cuttlefish, local vegetable , beancurd with spices javanese shrimp, peanut chili sauce. Tropical mixed fruit dressed with piquant shrimp paste. Startes include oysters, crabs, mussels and prawns on ice served with 5 delicious sauces. Something interesting for fans of shell fish is the kerang rebus (boiled cockles ) station. Star of the Buffet : Rice and hot dishes are the centre of all Ramadan buffet spreads. At the halal -certified Living Room, Diners are spoilt for choice with the 7 rice varieties including the Westin Briyani, Pulut Rendang Udang and more. Accompanied by any of the 3 aromatic gulai and other famous Malay dishes such as rendang paru, sambal goreng Jawa, Baked Whole Lamb, Otak-Otak, Ikan Merah Panggang and others. You can also enjoy your rice with a whole range of claypot dishes like Wok Baked Beef Sliced with Green Leek Stick, Pan Seared Tiger Prawns, Chili Barbecue Sauce and Stir Fried Baby Asparagus, Taste Olive and Three King Mushrooms , amongst other. Tumeric with coconut milk braised pinapple and salted fish. They even have a humble corner for chinese cuisine too! 'Stir Fry Three King Mushrooms'. They also serve traditional roasted chicken rice too! If you are looking for a taste of something different during Ramadan, then the Tacos counter is a must-stop. 5 different tacos - beef, seafood, chicken, cheese and sweet are all set to tantalize your tastebuds. 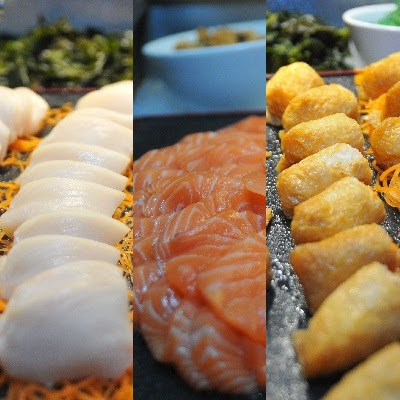 The buffet is priced at RM108++ for adults and RM54++ for children aged 4 to 12. Santapan Ramadan will be open from 7pm until 10:30pm and will run until August 18, 2012. There will be a 20% discount for bookings made 2 weeks or more in advance, and a 10% discount for bookings made one week in advance. There is also a group discount: for every 10 paying guests, one person dines for free. The hotel offers two special Ramadan Event packages catering to groups of 20 or more. Reservations are highly recommended.